There are lots of reasons we all like sports. The brilliance of Charlie Weis, the honesty of Nick Saban, the pout of Tyler Hansbrough after he gets cracked in the chops. All good reasons. But one of the biggest reasons is that we can often escape from whatever else is going on in the world. After 9/11, many people couldn't wait to enjoy sports again, as it signaled at least some return to normalcy. Two days ago, my Sports Illustrated arrived and I had to do a double-take. 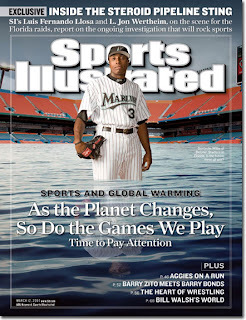 SI has a cover story on global effing warming and how it's affecting sports? Really? I knew Al Gore and his questionably scientific methods had infiltrated Hollyweird, but I guess I didn't realize it had seeped into the sports world as well. There is plenty of research (some of it even in easy-to-read books) detailing that global warming, at the very least, is not the Earth-ending epidemic that Gore and his liberal buddies would have you believe. I suppose we should thank him for the fact that you're reading this, though. You know, Internet and all.